Burning the rest of the world’s untapped fossil fuel resources – an equivalent five trillion tonnes of carbon emissions – would push up the average global temperature by between 6.4C and 9.5C. Those are the big figures behind a major new study published today in the journal Nature Climate Change—and they’re much more serious than had previously been anticipated. The study, led by the University of Victoria in Canada, further estimated that this level of extra emissions would elevate Arctic temperatures between 14.7C and 19.5C. In the absence of efforts to mitigate climate change, cumulative carbon emissions would likely exceed two trillion tonnes of carbon before the end of this century. Etc., alarming, blah, blah, scary, blah. The paper referred to is “The climate response to five trillion tonnes of carbon“, by Tokarska et al., published by Nature Climate Change on 23 May. It reports on climate model runs based on the IPCC’s RCP8.5 scenario. This is the most extreme of the imagined futures dreamt up by the IPCC, in which human emissions continue to rise with no attempt to stop them. At the same time, it assumes high population growth (which pushes up emissions), slow income growth (less funding for the environment) and little improvement in technology (no energy innovation). There are defects with this paper in assumptions, methods and reasoning. Concerning methods: the use of climate models does not constitute scientific observation of natural phenomena or the provision of any kind of evidence. They have not been subjected to a rigorous level of verification as, for example, have nuclear weapons models. Many people, environmentalists among them, strongly oppose spending public money to build nuclear weapons. Yet the policies required by these extravagant climate predictions will ultimately, if our leaders believe them, cost us vast sums. Nuclear weapons would be cheaper. Under the IPCC’s guess in RCP8.5, total radiative forcing from human emissions of GHGs would reach 8.5 W/m2 by 2100. According to AR5, this would produce a likely temperature increase of 3.7 °C (2.6 to 4.8 °C). Bad enough—even unprecedented—but this paper surpasses the IPCC’s guess by no less than 100%, suggesting the upper bound could be doubled to 9.5 °C. INCREDIBLE! I must say that it is very strange to see the scientist James Renwick pictured in the Herald gazing calmly into the middle distance while discussing this scary escalation of temperature as though it’s not the most outrageous climate forecast we’ve ever heard. Although the maximum variability of earth’s mean temperature is about 10 °C, it has never been 10 °C warmer than current temperatures—not in 4500 million years. Whatever reservations we might hold over the climate’s likely sensitivity to further parcels of CO2, RCP8.5 poses other obstacles to easy acceptance. For example, it sets such extreme limits on industrial and social development they are unlikely to transpire. It views as unlikely an effective human response to what would be a clear and growing problem, which alone makes it scarcely credible, because if a climate problem becomes detectable, man always does something about it. The paper has obvious defects which James Renwick fails to discuss. For a start, over two hundred years must elapse before our emissions reach 5 trillion tonnes of carbon and cause this ferocious 9.5 °C increase in temperature. The Herald says we would reach only 2 trillion by 2100. So there are 208 years to go. The unjustified tone of urgency rather paints the authors closer to activists than scientists. What time is estimated to burn through our remaining reserves of fossil fuel? Some recent figures estimate that oil and gas will each last about 200 years, and coal about 3000 years. One might guess that liquefying much of the coal to replace dwindling liquid fuels could extend this by several hundred years—let’s say another 500 years, for a total of about 700 years. Of course, we’re constantly making new finds and fracking is revolutionising the playing field by extracting more from difficult fields. Nobody can predict either future discoveries of oil and gas or future scientific advances. Another problem with these extraordinary predictions is presented by the extreme complexity of the planetary climate. The theory is that carbon dioxide increases atmospheric temperature, but observation shows that increases in carbon dioxide always follow a temperature rise. I’ve never heard a sensible explanation of this extreme contradiction between theory and observation, but the truth is the temperature controls the level of atmospheric carbon dioxide, not the other way around. The deep ice cores from Antarctica reveal that atmospheric temperature changes came before changes in carbon dioxide content. Recent papers show that it is still happening and on all time scales. For example, Humlum et al. in The phase relation between atmospheric carbon dioxide and global temperature (2013). We find a high degree of co-variation … but with changes in CO2 always lagging changes in temperature. The maximum positive correlation between CO2 and temperature is found for CO2 lagging 11–12 months in relation to global sea surface temperature, 9.5–10 months to global surface air temperature, and about 9 months to global lower troposphere temperature. The correlation between changes in ocean temperatures and atmospheric CO2 is high, but [does] not explain all observed changes. Again, this is from observation. The only indication that carbon dioxide causes atmospheric temperature increases is climate models, programmed to implement the warming observed under laboratory conditions. But because weather is chaotic and unpredictable, we don’t understand it; because we don’t understand it, and we create climate models, the models don’t understand it. So neither they nor we can predict the weather beyond a few days. Finally, the accumulated “man-made” fraction of carbon dioxide, according to a recent paper, amounts to about 15 ppm of the atmosphere. This is only 3.75% of the total carbon dioxide, or—wait for it—only 0.000015 of the atmosphere (one-and-a-half one-hundred-thousandths). This is less than the amount of neon in the atmosphere. It is outrageous to claim that our emissions of CO2 might control global temperatures, for the atmospheric mass of accumulated man-made CO2 lacks the capacity to exert the necessary thermal influence. It would hardly warm a flea. I note the strong El Nino is over and the cooling is well under way. Dr Renwick’s prediction of many degrees above present temperatures is unreliable. It is perhaps more reliable as a measure of the degree of panic the alarmists are feeling as the climate refuses to cooperate and their narrative of doom unravels. Reminded me of Are We Feeling Warmer Yet, so how can anyone trust what NIWA puts out. Good comments, John, and thanks for the link. I’ve had a quick look but I’m busy right now. I’m pleased to hear some of what Brett Mullan says but not all of it. I’ll post some comments later when I get the chance. Speaking of RCP8.5 and exaggeration, Christchurch City Council have released their new coastal flooding maps that show the flood risks for 0m, 0.5m and 1.0m of sea level rise above today’s. Is CCC alone in the world in preparing for the worst (and most unlikely) scenario the IPCC could dream up? Have they read a description of it? Good to hear that known reserves are now 5000 GTC and we are only using about 9GTC per annum. The world is in good shape. Calcite deposit rate would increase and add to current deposits circa 6,000,000 GTC. I think the earth will look after itself. Willem de Lange has been nominated to the panel. That’s great news. I’ve just found the story. Reading between the lines, it sounds as though you and your compatriots have been giving the council a stern test on coastal hazards! And they ought to be tested. Well done. As is an acid test for the “heat trapping greenhouse gas” conjecture i.e. if temperatures revert to ENSO-neutral and then below (as they did in ’98 El Nino), GHGs will NOT have “trapped” the heat-in-transit from ocean to space. Climate scientists who have claimed the El Nino spike for AGW, namely, Gavin Schmidt, Stefan Rahmstorf, Steven Sherwood, Grant Foster, Micheal Mann, and the UK Met Office among others, will be wrong. The Kelvin-Planck statement of the Second Law of Thermodynamics states to the effect that excess heat from a cyclic heat engine is expelled to a heat sink. In the case of earth’s troposphere the heat sink is space. ENSO-neutral temperatures of the troposphere are simply supported by the earth’s largest heat sink, the ocean (just plot SST vs LOT with 5 yr smoothing NH and SH seperately). Whatever heats the ocean heats the troposphere after a time lag due to thermal inertia (“10 – 100 years” – Trenberth). Given the sun heats the ocean predominantly in the tropics then the earth’s heating agent, therefore the troposphere’s heating agent, is the sun. The sun heats the ocean. The ocean heats the troposphere and modulates tropospheric temperature. Period. GHGs are simply passive heat transfer mediums. CO2 by definition a coolant, refrigerant code R744. The finding on the “good science” criteria will make interesting reading – between the lines. On the Bexley map, you can see current flood hazards in pink, projected 0.5 m hazards in purple. The 1.0 hazards are vertical hatch pattern. Global warming will create hundreds of millions of climate change migrants by the end of the century if governments do not act, France’s environment minister has warned. Ségolène Royal told ministers from 170 countries at the UN environment assembly in Nairobi that climate change was linked to conflicts, which in turned caused migration. News bought and paid for by the UN. Meanwhile…….. Apparently “Climate change issues lead to conflict” but labour protests lead to a fossil fuel emergency in France and worker – (Socialist) govt conflict. I’m getting a mixed message. Autumn Nicholl, 4, and her brother Theo, 5, were among those who came out in support, with their Mum Fiona Nicholl. Young Theo had been learning about climate change at his West Spreydon school. He said he was worried about the “fish dying”, while younger sister Autumn was most concerned about the whales. What about the puppies and the kittens? Didn’t the teachers tell them about the puppies and kittens that are crying themselves to sleep over climate change? 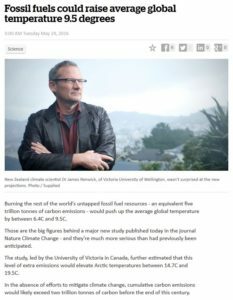 The paper highlighted in the post is really being pushed into the media by the “Science Media Centre” . First in the Herald, now in Stuff. “The climate response to five trillion tonnes of carbon“, by Tokarska et al., published by Nature Climate Change on 23 May. It reports on climate model runs based on the IPCC’s RCP8.5 scenario. Q: What would happen to the atmosphere if we burned all our fossil fuels? If we were to use up all of our planet’s fossil-fuel resources, we’d increase the global average temperature by about 8 degrees Celsius globally by 2300, Canadian scientists report in Nature Climate Change. The estimate is realistic, given the physical processes included in the models analysed. The results are consistent with results shown in the last Intergovernmental Panel on Climate Change report, where the extended scenario: RCP8.5 – the one where we just keep burning the fossil fuels – showed warming of 8C or 9C by 2300. The estimates in this paper are realistic – and very worrying. The amount of warming and climate change shown by these results would throw global society into chaos and would likely result in billions of deaths, from hunger and conflict over resources. Or, be more than a little sceptical of Chicken Little Renwick and “the physical processes included in the models analysed” given the inability to model the current climate – let alone 2300. 1) Do they want to establish RCP8.5 as the default scenario in the public mind? 2) Is this, among other things, to justify CCC’s use of RCP8.5 in coastal policy and regulation? The Christchurch Press has been doubling down on climate propaganda this weekend. The Saturday editorial was critical of the peer review process, implying that it wasn’t necessary. John Fyfe, Gerald Meehl, Matthew England, Michael Mann, Benjamin Santer, Gregory Flato, Ed Hawkins, Nathan Gillett, Shang-Ping Xie, Yu Kosaka, Neil Swart & Kyle Armour. Stefan Rahmstorf, Grant Foster, and Niamh Cahill. BTW, check out the “HIST” profile vs observations in Figure 1a and 1b in the “Slowdown” link. HIST is – “….a global climate model4 [see ref 4] in which ten simulations were conducted with specified external forcing (in greenhouse gases, aerosols, volcanic effects, land use, stratospheric ozone and solar variations; the HIST ensemble)”. In other words, the spat over whether there’s been a “slowdown” in observations or not is of no consequence – it’s HIST vs Obs that matters. And HIST demonstrates a falsification and failure of AGW theory. Rahmstorf, Foster, and Cahill ignore HIST entirely. Egregious twaddle. The atmosphere does NOT heat the ocean, the sun heats the ocean predominantly in the tropics (Fairall et al 1996, Cronin and McPhaden 1997). In respect to the ocean, any “global warming” is solar-driven. Even the IPCC cannot come up with an anthropogenic ocean warming process. They have speculation (“air-sea fluxes” – no citation) but no evidence (AR5 Chap 3). SMC are peddling lies and falsehoods. These people are NOT “experts’, they are scientific frauds. Meteorologist Joe Bastardi tweeted at Twitter the latest surface temperarture developments. I posted on this here yesterday. Trace gas CO2 obviously is unable to trap the heat and keep the surface temperatures elevated. Rather the surface temperatures are driven (over the short term) by ocean oscillations – over the past year primarily by the ENSO. SH is below the 1981 – 2010 climatological mean. And CO2 “heat trapping” falsified.